I love mid-week holidays! This year, the Fourth of July falls on Wednesday, which means mid-week mayhem! My mid-week manicure is another trigger pistol accent using some 3D accents. The two trigger fingers are both OPIs - An Affair in Red Square and Swimsuit...Nailed It!. I usually don't like shimmers like these, but I absolutely love these. They're perfect. My Boyfriend Scales Walls is the base of the non-trigger fingers, and the glitters used for that are both L.A. Girl Glitter Addicts - Animate and Jostle. Happy Fourth of July everyone! I hope you enjoy fireworks. We'll be doing some impromptu fireworks by throwing lights up in the sky. Fire bans are rampant in the dry parts of Colorado, so the Boulder display won't be going off. Cute! And for some reason it reminds me of Captain America! Love the stars! They are a nice contrast!! The stars are soooo cute :) lovely mani! Great mani. I also used My Boyfriend Scales The Walls as my white. It just seems like a better alternative to a shocking white like Alpine Snow. Have a happy 4th and be safe. Awesome! I love your 3D accents! 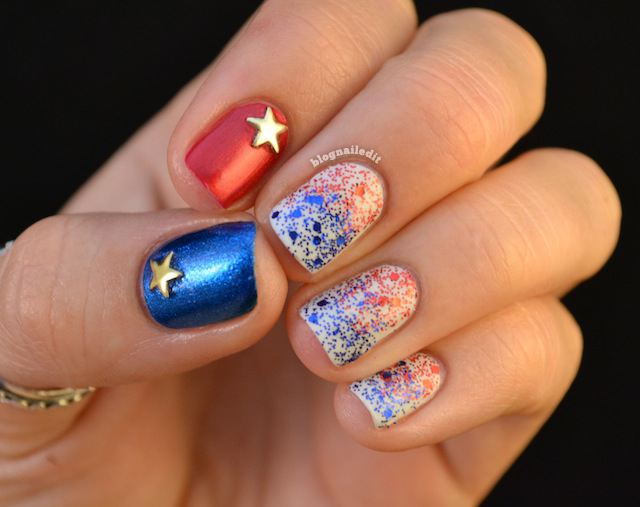 Love those stars, I'm dying to find some gold charms like that for my nails!